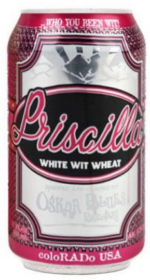 Priscilla is an American beer, it has an alcohol content of 5.2%. This American take on the Belgian Classic Wit, featuring orange peel and coriander spice emanated from the basement blues music legacy Dave McIntyre (Oskar Blusologist) built at the original Oskar Blues Grill & Brew in Lyons, CO. On draft for over a decade, Priscilla‘s zesty citrus and light fresh baked bread aromas mix with spicy, fruity fermentation. Light bodied with a subtle savory spice accent and a dry, lightly tart finish you can nearly feel the flicker of the neon and sounds of the King.